Liverpool's loss wasn't as catastrophic as it could have been, but the Champions League's Group C is unexpectedly tight from top to bottom. Elsewhere, Barcelona is guaranteed to go through but Tottenham isn't dead yet, thanks to Harry Kane. Liverpool suffered a shock defeat away to Red Star Belgrade to squander its advantage at the top of Group C and miss an opportunity to pull away from the pack, while Barcelona clinched a place in the last 16 and Tottenham kept its slight hopes of progress alive in the first half of the UEFA Champions League's Matchday 4 fixtures on Tuesday. Two goals from Milan Pavkov gave Red Star Belgrade a 2-0 win over Liverpool, but the result's impact was lessened for the Reds after Napoli drew 1-1 with Paris Saint-Germain in the group's other match. Juan Bernat turned in a Kylian Mbappe cross to give PSG the lead in first-half injury time, but Lorenzo Insigne leveled from the penalty spot as the teams played to a draw for the second time in a span of two weeks. In Group B, Barcelona guaranteed its place in the last 16 with a 1-1 draw at Inter Milan. Maligned substitute Malcom struck just after coming off the bench in the 83rd minute, but Mauro Icardi equalized four minutes later, meaning the 2010 champion leads Spurs by three points in the race for second place. Two Harry Kane goals with 12 minutes remaining kept Tottenham from elimination, as it came back after conceding to Luuk De Jong 62 seconds in at Wembley Stadium to beat PSV 2-1. Elsewhere, Borussia Dortmund suffered its first defeat of the season, going down 2-0 at Atletico Madrid, with the goals coming from Saul Niguez and Antoine Griezmann. Both teams need just a point to secure progress, though, due to the results piled up by Club Brugge and Monaco. The latter slipped to an embarrassing 4-0 defeat to the former, as its season goes from bad to worse. Thierry Henry is still without a win after five games as manager, and his side is out of contention for the knockout stage with two matches to spare. In Group D, Porto needs just one more point to secure its passage to the last 16 after a 4-1 victory over Lokomotiv Moscow, while Schalke is second in the group after a 2-0 win over Galatasaray. Guido Burgstaller capitalized on a mistake from the Galatasaray goalkeeper Fernando Muslera in the third minute, and Mark Uh added the second for the Bundesliga side. Liverpool lost the top spot in Group C as it slipped to an unexpected defeat way to Red Star Belgrade. Jurgen Klopp’s side hit the woodwork twice but was sloppy for a second straight Champions League away game and has now won just three of its last nine matches. Xherdan Shaqiri was left at home by Liverpool, a selection decision that has provoked significant hand-wringing. He would have been guaranteed a hostile reception after celebrating a goal for Switzerland against Serbia at the World Cup and forming the Albanian eagle with his hands, an inflammatory gesture given the tensions between Albania and Serbia over Kosovo. But the decision was Liverpool’s, as there was no suggestion, either from Red Star or any official body, that it would have been unsafe for Shaqiri to travel. From Liverpool’s point of view it makes sense: there is no point in making the atmosphere more tense for a fringe player who will now be rested and relaxed for Sunday’s home game against Fulham. Perhaps his influence form the bench would have made a difference, but Shaqiri’s absence was not the reason for the defeat. Instead, this was a much improved Red Star performance, far more organized and far more disciplined than it was in a 4-0 defeat at Anfield two weeks ago. Pavkov, who hadn’t started a Champions League game before Tuesday, headed in a right-wing corner after 22 minutes and Virgil van Dijk failed to get close to him, and seven minutes later shook off an ineffectual challenge from Georginio Wijnaldum to smash a shot past Alisson from just outside the box. With Liverpool dropping its points, the opportunity presented itself for Napoli or PSG to take advantage of the group, but neither could secure all three points. The best and worst of PSG were on display again in Naples. In the first half, as Napoli strangely sat off, PSG was dominant and took the lead through Juan Bernat’s first goal for the club, steered in off-balance from Kylian Mbappe’s cross. But as Napoli pressed higher after the break, PSG was rattled. Gianluigi Buffon had made a series of saves even before conceding a penalty with a clumsy tackle on Jose Callejon. Insigne converted from the spot, salvaging the point and making for a congested group heading into the final two matches. Napoli tops the group, level on points with Liverpool but ahead on tiebreaker and one point clear of PSG. Red Star sits just one further back, which sets up a tense race to the finish in what was supposed to just be a three-team battle. It's worth noting that Liverpool has the toughest run-in of the bunch, playing at PSG before closing group play at home vs. Napoli. It did itself no favors by missing out on at least one point against the group's weakest side. Henry’s start of managerial life has gone from bad to worse. His first four games in charge of Monaco had resulted in two draws and two defeats, and his fifth brought a 4-0 home defeat against Club Brugge. A goal and a penalty from Hans Vanaken and another from Wesley had the Belgians 3-0 up inside 24 minutes, and Ruud Vormer added a fourth with five minutes remaining. The defeat leaves Monaco bottom of the group, out of the Champions League and three points behind Brugge for third place and a spot in the Europa League knockout stage. 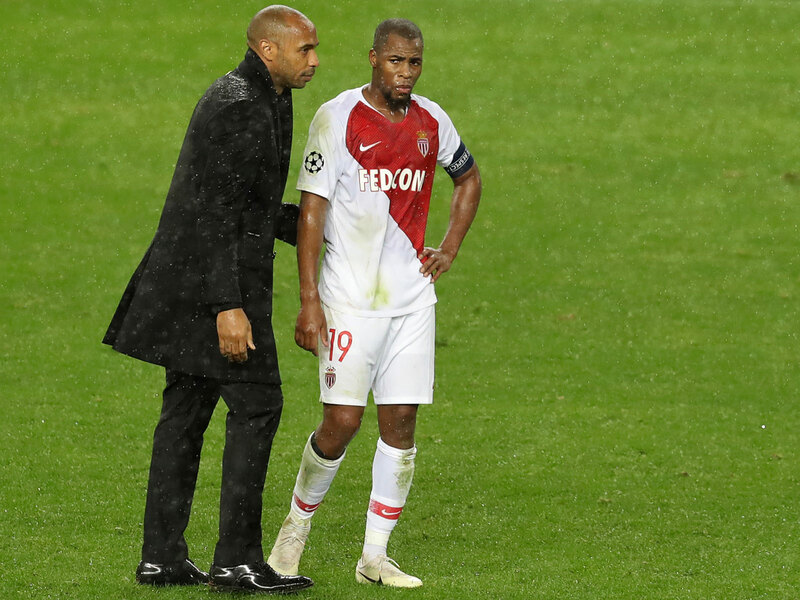 With Monaco second from the bottom of Ligue 1 and without a win in 15 games, Henry’s future already looks in doubt–or it would were there any semblance of leadership at an increasingly stricken club. A second summer of major sales and some inferior replacements have left a weakened squad, but the problems run deeper than that. On a bleak day for the club, its president, Dmitry Rybolovlev, was arrested in Monaco on corruption charges, while his mansion was searched. Monaco was also facing further claims of breaches of FFP as a result of the Football Leaks revelations. It's a fall from grace for a club that surprised as a semifinalist just two seasons ago.